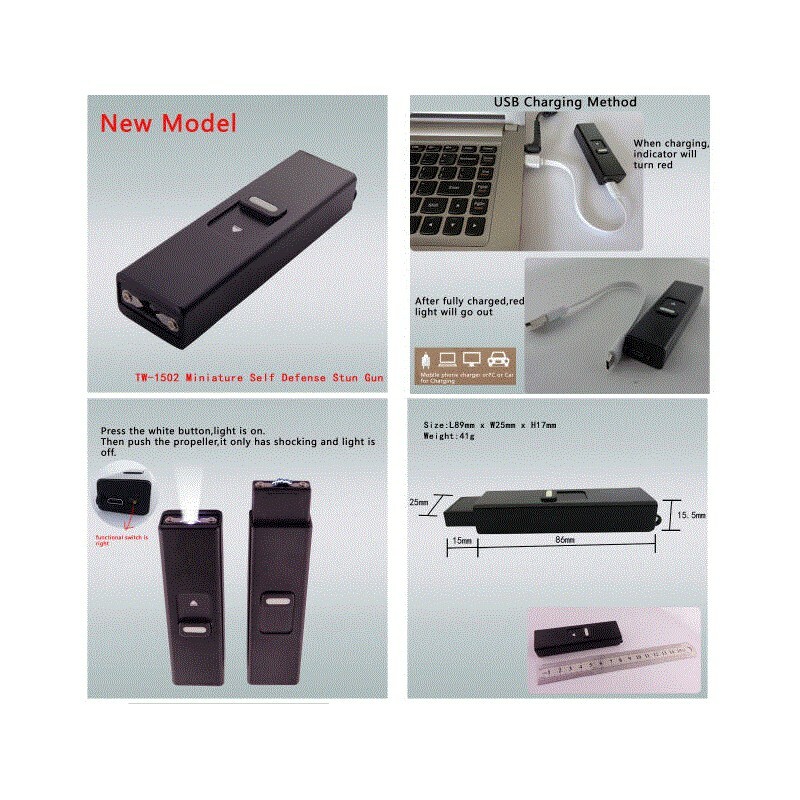 TW-1502 miniature Stun Gun self defense. Keychain. Color - black, gold, steel, blue and pink. Unique sliding design to activate stun feature. It is small but strong enough to scare the attackers. 3. Electric shock activated by push out propeller, and with automatic homing feature . 4. Large capacity lithium polymer battery ( preventing over - charging and over - discharging protection),USB interface charging. 5. With LED light,high voltage shock functions. durable in use. Before using, it should be fully charged at least 2-4 hours, insert the USB connection into the computers USB interface or mobile phone charger;when charging, indicator light turns red. 1. After fully charged,the red light will go out. 2.Push the functional switch to OFF position,it doesn't work. Toggle the functional switch to light and electric shock symbol, press the LED control button in the center of product, light will be at work. 3. Push up the shock control button, shock will be launched and light will be auto-off. 4. Shocking will be stopped for protection after continuously shocking for 3-5 seconds.If required,please push the shock control button again. Note: Buy Mini Stun Gun in EU only if your are at least 18 years old.